An Ordinary Life : Science: STEP-BY-STEP how to make a mechanical hand! 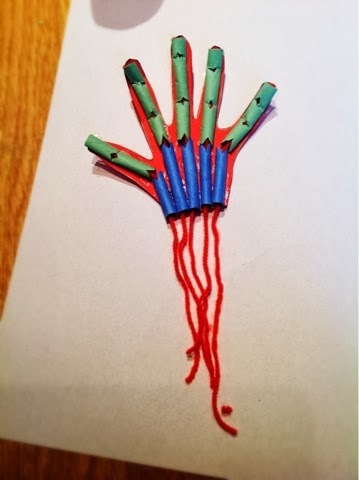 Science: STEP-BY-STEP how to make a mechanical hand! This is actually quite a simple idea although only older children and teenagers will probably manage this independently. I only say this as I feel it would be more difficult for most younger people, although my 6 year old enjoyed watching her older sister and myself put it together the other day. She is also enjoying playing with it and is interested to understand how it works and talk about the bones, so it makes for a great classroom resource to bring science alive! 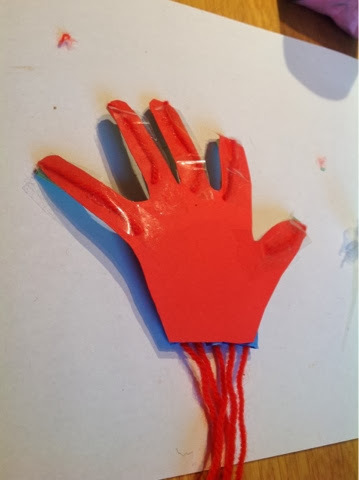 Now for the STEP-BY-STEP of how to make your mechanical hand! Get your piece of paper and draw round a hand! 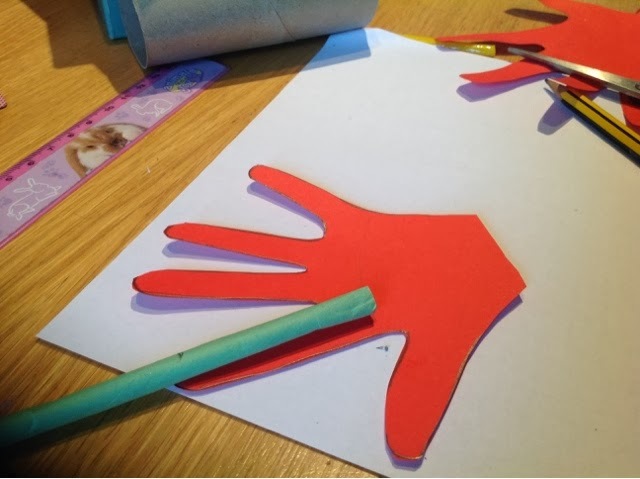 Cut out your hand shape. You will notice when you curl your own hand into a fist that you have three bends to each finger, they are your phalanges bones. The end of the last bend (your knuckles) you will notice is a little way further down your hand than where your fingers appear to end. The line on the paper we used seems faint against the red, but if you look for it you can see it. Take a straw and put one end at the line you've made on your hand to the tip of a finger and mark off on your straw, so you know how long you will have to cut your straw bone, like in the picture above. Do this for all five digits, 4 fingers and a thumb. 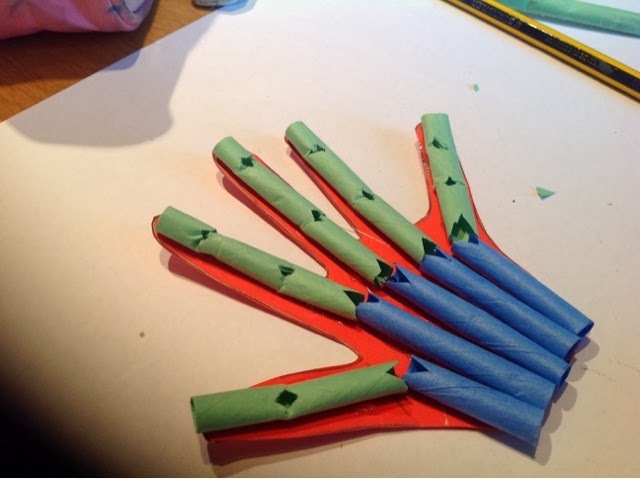 I colour coded the straws/bones so all the Phalanges bones were green and the metacarpals were blue, it doesn't need to be that way, it's optional. There are three types of phalanges bones in your fingers the Distal phalanges, in the tiny bone at the tip of your finger; the middle phalanges, the next bones down from the distal; and the proximal phalanges, the one the ends at your knuckles. Where each of distal and the middle phalanges meet we will carefully cut out a diamond shape like in the photo above. We will do the same to make the joint for the middle phalanges to the proximal and then a triangle at the end, where it will meet at the metacarpal bone. The pictures will help you to see what I mean. Do this for all four fingers but when you get to the thumb you only have two bones, the distal and the proximal so only one diamond in the middle and then a triangle cut out at the bottom. Now you are ready to add your metacarpal bones. These are the bones that run through your hand. you can feel then easily on the back of your hand. Measure each straw, like in the picture below, from the bottom of your proximal phalanges to the wrist on your paper hand, marking each off so you know where to cut. Cut another triangle at the top of the metacarpal straw bones so they make a diamond when fixed down under the phalanges, look at the picture below this to see what I mean. Carefully glue all the pieces down so the diamonds and triangles are all faced upwards. Wait for the glue to dry. Thread your string or wool up through a metacarpal and then up through the phalanges above it. 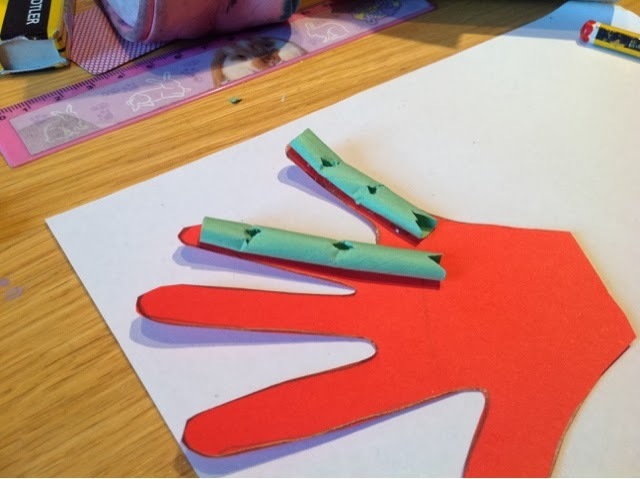 Pull the wool over and round the back of the hand and then stick the wool to the back of the finger you are doing and stick it down with tape. You are finished. To work your mechanical hand pull the wool strands. Can you make a fist shape? The wool acts like the tendons in our own hands, as they tighten the hand moves just in the same ways as our own hands! 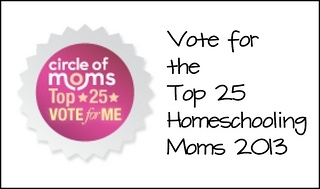 Thanks for leaving a comment here! It's always nice to interact with my readers! 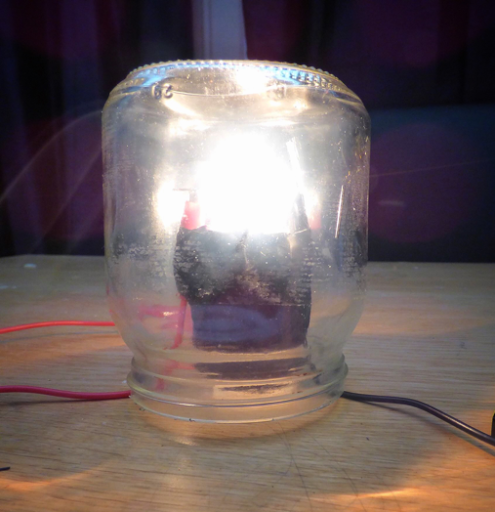 Cool project, and one that can be done by all ages, good stuff. Thankyou for this great idea.I did this with my two children and they really enjoyed it.We will be doing many more of your experiments/projects. Where did you get your straws from? Did you make them yourself? 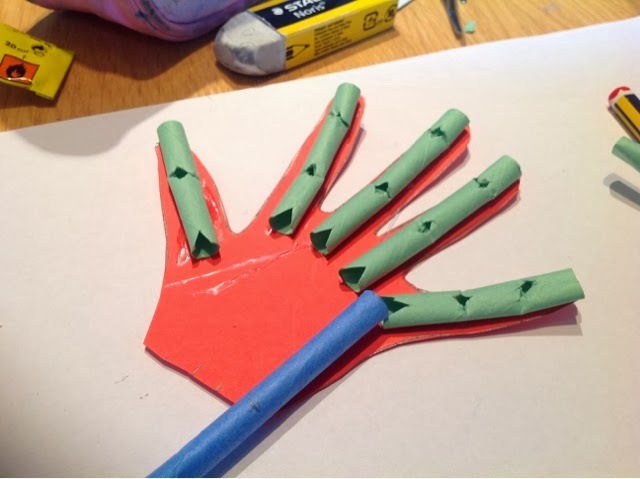 I tried this today with plastic straws and the hand worked well, only it won't curl into a fist (like you mentioned!). Thanks! can it pick up light things? like a Hershey's chocolate kiss?